Charles Robert Maturin ( b. Sept 25, 1782 - d. Oct 30, 1824) was an Irish Protestant clergyman ordained by the Church Of Ireland. After attending Trinity college in Dublin, has was ordained curate of Loghrea in 1803. He married the acclaimed singer Henrietta Kingsbury, sister of Sarah Kingsbury, whose daughter Lady Jane Wilde was the famous Irish nationalist poet known by the pseudonym Speranza and was the mother of Oscar Wilde. Maturin was therefore the great uncle of Oscar Wilde by marriage. Maturin's early works were commercial and critical failures but were noticed by Sir Walter Scott who recommended Maturin's work to Lord Byron. Thanks to the support of these two literary giants, Maturin's play, Bertram, was a success, running 22 nights on Drury Lane. The play caused considerable scandle and was denounced by Samuel Coleridge as "melancholy proof of the depravation of the public mind". Although Maturin had been writing under the pseudonym Dennis Jasper Murphy, he had dropped the nom de plume to collect the profits from Bertram. When the Church Of Ireland discovered the identity of the plays author, he was forever barred from advancement as a cleric. Unable to support his family on his meagre salary as a curate and having spent the profits from the play to help his unemployed father and a bankrupt relative, Maturin was forced to make his living by writing. After writing a couple of unsuccessful plays, Maturin switched back to novels. In 1820 he published his masterpiece, Melmoth the Wanderer. The story is based on the medieval myth of The Wandering Jew, in which a man who taunts Christ while he is carrying the cross to Golgotha is cursed by Jesus to walk the earth until the day of last judgement. The central character of the novel is Melmoth himself, the ultimate byronic-satanic antihero. He has made a pact with the devil. In exchange for 300 years of immortality, he must surrender his soul and be damned forever unless he can find someone who is willing to take his place before his 300 years have expired. As his deadline approaches, Melmoth searches the earth for someone desperate enough to give up their soul. He seeks out the utterly hopeless in the throes of despair and poverty, in the cells of the madhouse, and the dungeons of the inquisition. Maturin uses various documents such as letters and memoirs to relate the stories of those who encounter Melmoth in what becomes an indictment of mans inhumanity to man and the tyranny and intolerance of the church and of society in general. Melmoth's long experience with mankind's cruelty has made him world weary, cynical, and nihilistic. Maturin's prose waxes sublime and eloquent in his condemnation of humanity. Melmoth is the voice of those outcast from society and damned by god. Maturin has been much condemned as anti-catholic and anti-religious. Perhaps the victims of persecution by organized religion throughout history to the present day would consider his characterization of the church as an evil institution justified. Maturin himself would suffer for his courageous criticism of religious intolerance until his early death at the age of 42, amidst rumours of suicide. Melmoth The Wanderer has been criticized for it's complicated plot and for Maturin's often long winded and pedantic style. Some have even butchered Melmoth in an attempt to make it "more readable". Persevering through the multiple subplots of Melmoth pays rich rewards. Maturin's writing style builds suspense and atmosphere to a unique level of intensity. Melmoth is considered one of the great archetypal characters of all time. Honore de Balzac called Melmoth "the most disaffected character in literature" and even wrote a short sequel titled Melmoth Reconciled. Oscar Wilde himself apparently related to the outcast from his relative's novel. He used the alias and nom de plume Sebastian Melmoth during his Parisian exile in the last tragic years of his life after his release from Reading Gaol. Great review! What is the stunning book whose cover is one of your illustrations? 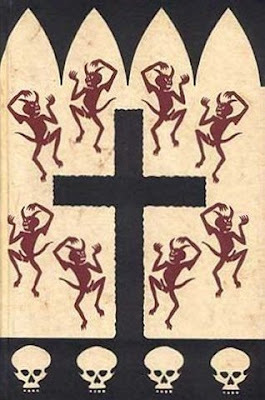 Its got a cross in the center, devils dancing around it, and skulls at the bottom. The illustration is the front cover of the wonderful Folio Society slip covered edition of Melmoth The Wanderer. I hope to obtain one someday. I have the Oxford paperback. The Folio Society cover is a nice complement to the F.S. edition of Kamen's The Spanish Inquisition, which I was lucky to pick up, in slipcover, for about 3 bucks at a local thrift shop. My heart probably would have stopped if I had found the Melmoth. I finally have my very own copy of the Folio Society edition of Melmoth the Wanderer. It's beautiful. 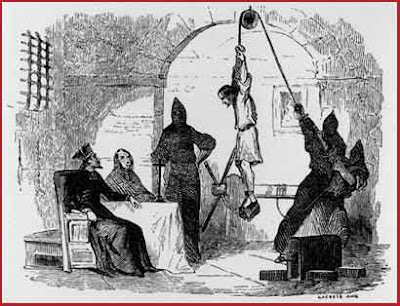 I'm now searching for a copy of Folio Society edition of The Spanish Inquisition by Kamen as you suggested.